Stand out for all the right reasons with the perfect mix of edgy and glamorous in our Avalon Medical ID Wrap Bracelet. Handcrafted on metallic rose gold tone leather, Avalon features a stunning, multi-faceted, moonstone center, bezel set and surrounded by sparkling cubic zirconia crystals. 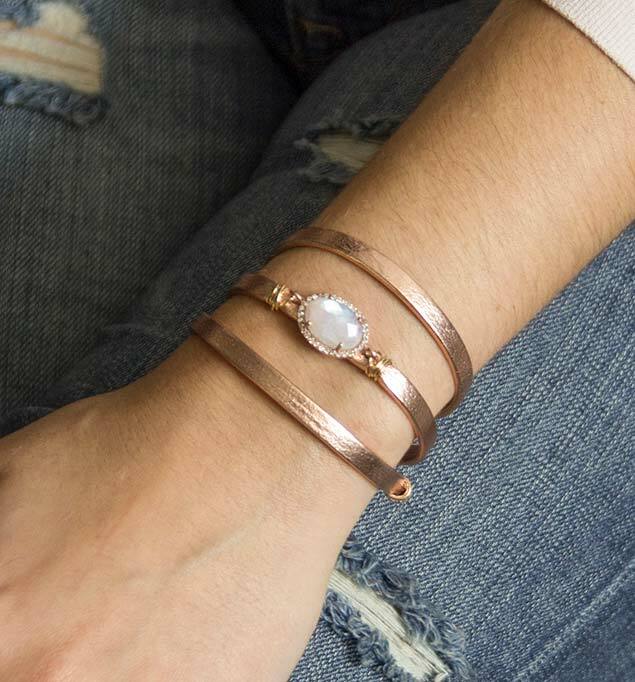 Each moonstone center stone is carefully wire-wrapped onto hand-cut leather by our Kansas City artisans to create an exceptional style you’ll love to wear. Pair your Avalon Medical ID Wrap with your Lauren's Hope medical ID tag, which features the internationally recognized medical caduceus symbol on the front, alerting first responders to your personal information, engraved on the back. Whether you or your loved ones wear a medical alert bracelet for weight loss surgery, lymphedema or post-mastectomy care, heart conditions, Parkinson’s, or any other medical condition or treatment consideration, wraps are a stylish, on-trend medical ID bracelet option. They’re also easy to put on, making them ideal for people experiencing swelling of the extremities, weight fluctuations, or dexterity challenges. Simply unclasp your medical ID bracelet, wrap it around your wrist three times, and re-clasp for a comfortable fit.